Complete an online application form (select a form below). A £200 non refundable deposit by bank transfer must be made within one week of your application to confirm your reservation. If the deposit is not received, your application will not be processed and may be cancelled. Applications received after 26 May 2019 will incur an additional £30 late administration fee per application. Beg. June: Confirmation emails will be sent to successful applicants. 27 June: Balance due to to secure place at camp. Camp Information Pack containing all camp details sent out before camp, on receipt of balance payment. Bursaries: We will try to help families in genuine need of financial assistance, but are restricted as to availability of bursaries. Bursaries will be considered for regular attendees of Ezra activities. Please email [email protected] for more information. All bursary applications must be submitted within one week of your on-line application and before 20 May 2019. All enquiries will, of course, be handled in the greatest confidence. Camps fill up quickly so we suggest you apply early to avoid disappointment. See below for more information and application forms for all camps. Ezra Boys run four summer camps for Chanichim in the UK. Boys attend from London, Manchester and beyond! Junior Boys is for years 4-6, Inter Boys is for years 7-8, Ultimate is for years 9-10 and Plus for year 12. 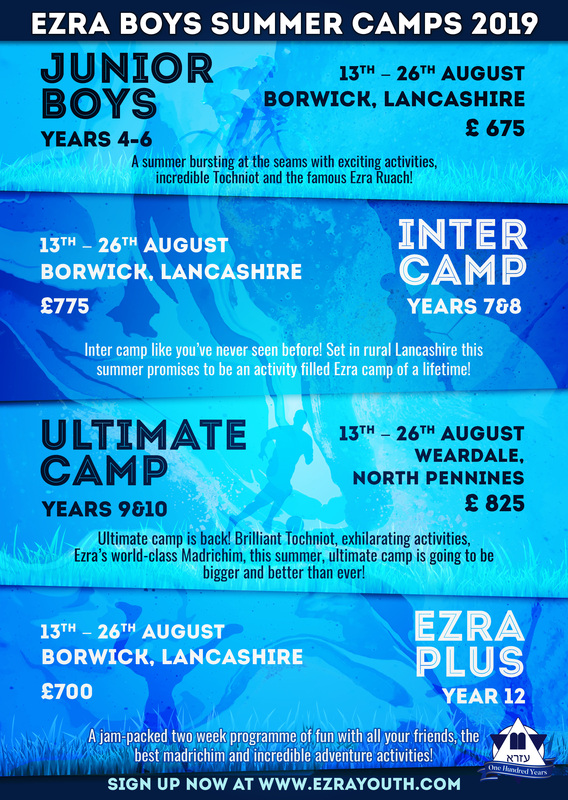 Set in an idyllic village in rural Lancashire, Ezra Junior Boys can look forward to two incredible action-packed weeks, filled with amazing Tochniot, thrilling activities and the incredible Ezra Ruach which has become the hallmark of an Ezra summer. Led by a large and dedicated team of friendly madrichim in addition to a warm and caring host family. Ezra aims to provide an exciting Summer for Junior Boys whilst maintaining the warm and caring atmosphere of home. Junior Camp is the perfect way to get accustomed to the camp environment and prepare for the more intense Inter camps to follow. Sign up, pack your bags and get set for an incredible Ezra summer! Camp this year will take place in a historic manor house in the middle of rural Lancashire, with exhilarating activities together with fantastic Tochniot dreamed up by a seasoned team of Ezra Madrichim. These experienced Madrichim under the guidance of an incredible senior Tzevet guarantee to produce an Ezra Inter Camp like you’ve never seen before. This summer promises to be one to remember! Apply for Ezra Inter Boys Camp Now! This summer, Ultimate camp will be travelling up North to an Area Of Outstanding Natural Beauty, the Northern Pennines! With bigger and better activities than ever before in addition to Ezra’s incredible Tochniot and Shiurim designed by some of Ezra’s most qualified Madrichim specifically for this age group. Don’t be left behind…join your friends for the summer of a lifetime! This camp always has a waiting list so apply now to avoid disappointment! Apply for Ezra Ultimate Boys Camp Now! Following on from an incredible Ezra Tour last summer, Year 12 Boys can look forward to another amazing Ezra summer taking part in a Camp designed especially for them. With the best activities, the most experienced and dynamic Ezra madrichot and the famous Ezra Ruach! Book your place and pack your bag, this camp has limited spaces and you do not want to miss out! Apply for Ezra Plus Boys Camp Now! Ezra Girls run three summer camps for Chanichot in the UK. Girls attend from London, Manchester and beyond! Junior Girls is for years 4-6, Inter Girls is for years 7-10 and Ultimate Girls is for year 12. 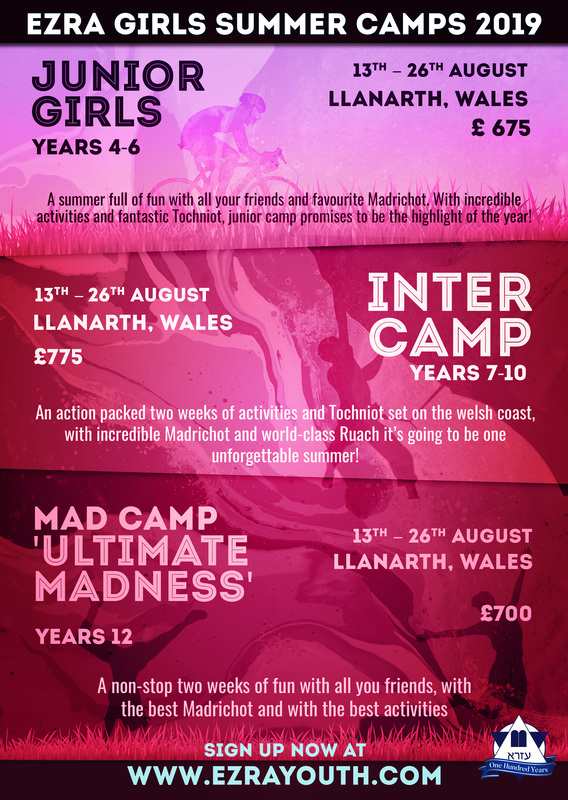 We are thrilled to provide a fortnight of our incredible Junior Girls Tochniot and exciting activities on the welsh coast. Led by a team of dedicated and caring madrichot and a warm, caring host family, Ezra Junior Girls will enjoy the feeling of a home away from home. We are Ezra Inter Girls…and the singing never stops! 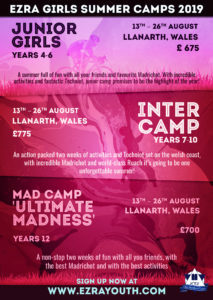 Bringing the Ezra ruach to Wales, Ezra Inter Girls can expect more incredible activities than ever. Our experienced team of fun loving madrichot are conjuring up incredible tochniot and our fantastic senior tzevet promise that this is going to be a camp to remember! After experiencing an incredible Ezra Tour last summer the Year 12 Girls can look forward to another amazing Ezra summer taking part in a independent camp, designed especially for them. With the best activities, the most experienced and dynamic Ezra madrichot and the famous Ezra Girls Ruach! Book your place and pack your bag, this camp has limited spaces and you do not want to miss out!